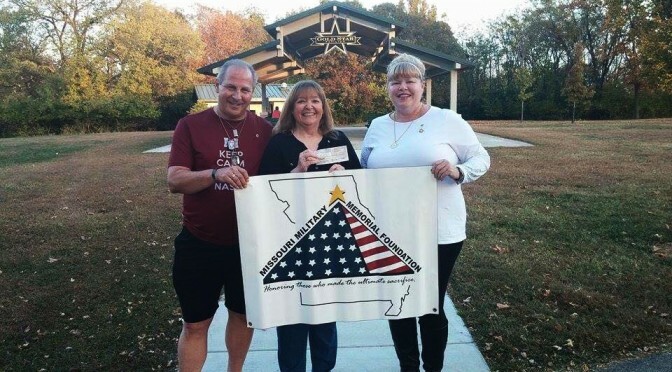 The American Gold Star Mothers, Inc – St. Louis Chapter donated $2500 to the Missouri Military Memorial Foundation on Thursday, October 22, 2015 at the Gold Star Pavilion in Jefferson Barracks Park. Pictured (L-R): Jim Jacobs, Vice President of the MMMF; Chris Andrews, President/Founder of the MMMF and Terrie Hobson, President of the American Gold Star Mothers, Inc. – St. Louis Chapter. We are truly grateful for their generous donation. Please visit their website to learn about what all the St. Louis Chapter is doing to honor their sons and daughters.